Happy Hump Day! Every now and again I come across a ready to wear garment that I really like and want to add to my wardrobe only to find out that its either out of my price range or not in my size. When that happens I try and see if its something that I can easily make myself. 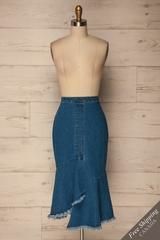 So is the case of this cute denim pencil skirt I came across one day while scrolling through pinterest. I posted the original image below. I particularly loved the assymetric hemline and raw hem on the peplum. I’ve been on an unfinished hem kick lately. I like distressed finishes on a garment but in moderation. And this skirt offers that balance for me. Below is picture of the inspiration skirt. I used simplicity 8394 as the foundation for this skirt. I’ve used this pattern before and I already knew that I liked the fit so all I had to do was alter the pattern. What was great about using simplicity 8394 is that I only had to alter the hemline of the skirt. It already had the peplum in the pattern. If you want to create this look for yourself but don’t own this pattern, I created an illustrated tutorial on how to alter this pattern using a pencil skirt. It includes how to draft the peplum pattern. I’ll be posting that either tomorrow or Friday. For my version I chose to use a rust colored stretch corduroy fabric that I purchased from Joann Fabric. I wanted a heavier weight fabric so that I could wear tights during the colder months. Fall weather is so tricky and dressing in layers is definitely the way to go. So I created a sleek layered look with a black turtleneck, black leatherette jacket, black fishnette tights and my Madden Girl peep toe stilleto booties. The skirt gives the look a nice pop of color and I added a cheatah print belt to add interest and definition at the waist. This looks great! Thank you for the inspiration! That skirt! Nuff said, I’m stealing it! Thanks Faye. Glad you like it. I’ll help you steal it. Tomorrow I’m posting the pattern hack tutorial. Lol!